John Codner (born John Whitlock Orby Squires Codner, Beaconsfield June 1913 - August 2008) was a British painter and wartime camouflage officer. He exhibited at the Royal Academy and his works remain today in major collections.His father was the society painter Maurice Codner, whose friend Sir Alfred Munnings encouraged John Codner to paint. He was educated at St. Edward's School, Oxford. Codner was a camouflage officer in Geoffrey Barkas's Middle East camouflage directorate during the Second World War. He arrived in Egypt on the RMS Samaria with other artists turned camoufleur including Steven Sykes (a stained glass artist) Edward Bainbridge Copnall (a sculptor), Jasper Maskelyne (a stage magician) and Peter Proud (a film art director). He worked on camouflage and deception with Peter Proud during the Siege of Tobruk, 1941, and under Steven Sykes on Operation Crusader. Codner studied at the Polytechnic School of Art, Regent Street, London, after the war. He then taught at the Sir John Cass School of Art, London from 1947 to 1951. He became a member of the Royal West of England Academy (RWA). He was best known as a figure painter, also creating still lives and landscape paintings. 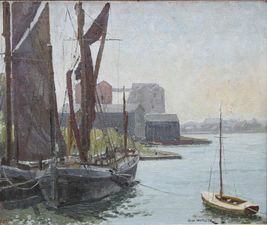 Codner worked from his studio in Stokenham, Devon. He exhibited his paintings at the Royal Academy and the RWA. He was an honorary member of the Bristol Savages.